Potato virus Y (PVY) is a major threat to potato cultivation worldwide. PVY exists as biologically and genetically distinct strains and causes varying degrees of pathogenicity and a wide range of symptoms in potato. Knowledge of the nature of PVY strains is essential for breeding PVY resistant cultivars that are durable against a wide range of strains. 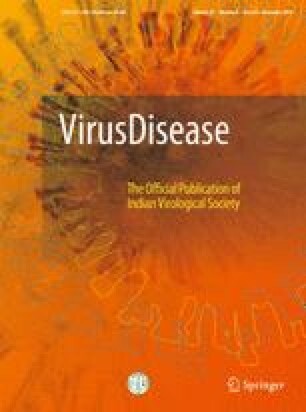 We report the complete genome of a PVY potato isolate (JK12) characterised from the potato production areas of Jammu and Kashmir, India. Nucleotide sequence comparisons and phylogenetic analysis with known PVY strains revealed that the isolate belongs to the NTN strain of PVY. At the whole genome sequence level, the JK12 isolate shared the highest identity (99.42%) with PVY-NTN strains reported from Germany, followed by those from United Kingdom (99.34%) and Japan (99.33%). Recombination detection analysis identified two recombination break points and JK12 appeared to have originated from a recombination event between a PVY-N strain from Belgium as a major parent and a PVY-O strain from China as the minor parent. Our results suggest possible mutation and recombination could be the basis for the evolution and the subsequent establishment of NTN in this region. Furthermore, a global evolutionary lineage analysis of all the known PVY strains showed relatively low nucleotide diversity among the PVY-NTN strains. Neutrality tests showed that all the genotypes of PVY are undergoing purifying selection suggesting population expansion of PVY. This is the first report of complete genomic characterization of an NTN strain of PVY isolated from commercial potato fields in India. The implications of the emergence of this strain in the Indian context are discussed. The online version of this article ( https://doi.org/10.1007/s13337-019-00526-5) contains supplementary material, which is available to authorized users. This work was supported by the Grant to AH by the University Grants Commission of India, No F. 5-4/2016(IC). Davie K, Holmes R, Pickup J, Lacomme C. Dynamics of PVY strains in field grown potato: impact of strain competition and ability to overcome host resistance mechanisms. Virus Res. 2017; 16:pii: S0168-1702(17)30119-3. https://doi.org/10.1016/j.virusres.2017.06.012. Kerlan C. Potato virus Y. AAB/CMI descriptions of plant viruses. 2006; 414. http://www.dpvweb.net/dpv/showdpv.php?dpvno=414. Nagy PD. Recombination in plant RNA viruses. In book: plant virus evolution. 2008; 133–156. https://doi.org/10.1007/978-3-540-75763-4_8.